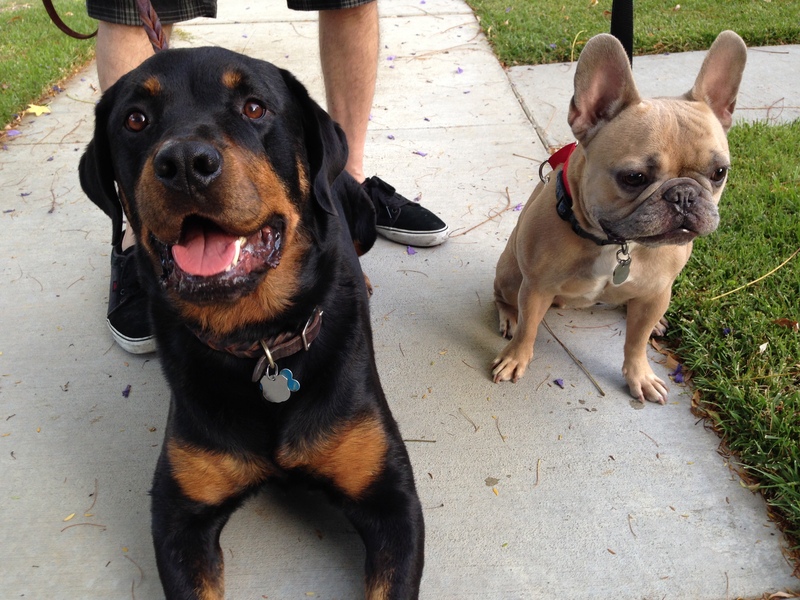 For this session I traveled to Burbank to work with a pair of dogs that don’t get along. Velzy (left) was added to the family earlier this year after being rescued from a bad situation. Well once their guardians got Velzy together with their own dog Kai (right), the aggression was so intense they separated them immediately and kept them apart except for when on walks. For all of you thinking the Rot may kill the French Bulldog, it was actually the other way around. When I arrived for the session both dogs were excited, but in different ways. Kai was barking excitedly from behind a baby gate that kept him in the adjoining room. Velzy on the other hand was barking in a territorial way from inside a kennel so I decided to start with him. I moved over to where his kennel was and turned so that I was facing away from it then sat down. Velzy paused for the briefest of seconds then continued barking at me in disagreement. I waited for another break in the barks and when it came, I scooted over closer to the kennel while facing away from it. I repeated this movement a few times until I was sitting an inch away from the kennel. I took out a high value treat and dropped it behind me into Velzy’s kennel. This caused him to stop barking again as he investigated then ate the treat. I tossed a few more treats into his kennel this way one at a time. While I was doing this, I kept facing front. To many dogs direct eye contact is a challenge and facing a dog can be interpreted as challenging. Due to his reaction and past history I wanted to offer Velzy the least confrontational experience I possibly could. After Velzy had calmed down, I slowly got up and moved into the other room to discuss the situation and work with Kai. While chatting up the dog’s guardians I learned that they had already worked with a few trainers with little success. While we continued our conversation I could see that while Velzy has some issues, Kai was the problem child in this relationship. He jumped up on his guardians, darted around the room in an over excited fashion completely ignoring his guardians attempts to disagree or correct him. When I passed through the baby gate into the living room, I made sure to keep Kai in front of me and I corrected him before he was able to jump up on me. Dogs often “claim” people by jumping up on them when they arrive and I wanted to make sure Kai understood I was not going to tolerate that. When we sat down to discuss the situation, Kai alternated between jumping up on his guardians, the couch and even the coffee table in front of the couch. When he jumped up on the table, I corrected him and made him get down. His guardians said “good luck” under their breath and went on to tell me Kai did it all the time. Their solution was to move the table further away form the couch. Unfortunately all this did was make things inconvenient for the guardians as the dog was able to jump up onto the table as he pleased. Making matters worse, Kai’s guardians had gotten into the habit of pushing him away when he jumped up on them or they wanted space. Because many dogs only push one another when playing, this method of correction can easily be misinterpreted by the dog as play rather than disagreement. I went over a few new ways to disagree with unwanted behaviors using body language and movement. Often times using verbal communication can confuse a dog whereas these new non verbal communication methods are the dog’s native language. I also suggested that his guardians stop petting the dog for simply being close to them as any time he was near, they would reach over and scratch or pet him. Even worse, they would pet him on demand whenever he jumped up or nudged them with his snout. Essentially Kai was giving them an order (Pet me). Each time his guardians obliged him, they were assuming a follower position. To help change the leader follower dynamic, I suggested some simple rules and structural changes they can adopt. Because dogs often relate their authority to the height they sit at, blocking Kai’s attempt to sit in a higher location than Velzy will help both dogs. To further help Kai start to see his guardians in an authoritative position, I ran through a leadership exercise that I developed a few years ago. The exercise involves placing a high value item on the floor in the middle of the room then claiming it as another dog would. Each time Kai violated the three foot boundary I wanted him to respect I made a sound or used movement to disagree with him. When he moved away or took a more subordinate position, I would take a step backwards. Only when the dog laid down did I give him permission to get the treat. After running through the exercise with Kai successfully, I walked his guardians through it until they got the same response. In addition to helping the dog see them as authority figures, the exercise gives the dog practice at restraining itself. It took a few repetitions, but within a couple of minutes Kai was sitting or laying down to communicate he was no longer challenging for the treat. After we finished the leadership exercise, Kai was noticeably calmer and more responsive to commands and corrections so I suggested we all go outside so that I could observe the dogs together in the back yard. Because of Velzy’s reaction to my arrival, it took a few minutes for me to open his kennel. Each time he got up or started to move forward, I would close the door. I wanted him to be in a completely calm frame of mind before we went outside. Once I was able to open the door completely with Velzy remaining in a sitting position I gave him permission to come out. While Velzy’s guardians fitted him up with his leash, I pulled out a Martingale and slipped it on Kai. His guardians had told me that he pulled on the leash to such an extent they were concerned he would strangle himself. I added my special twist to the leash then had the guardian’s take out Velzy first. I wanted Kai to engage in as many follower positions or postures as possible. Once we got outside, Velzy moved several feet away from us while maintaining a stiff body posture, lowered head and wide eyes. There wasn’t much more he could do to communicate he was uncomfortable. I split my time between observing him and keeping an eye on Kai. 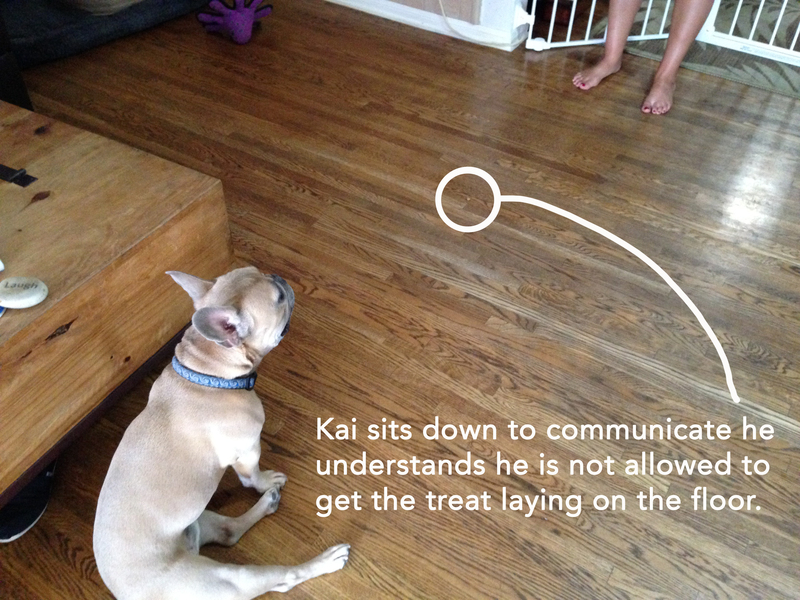 Each time that Kai started to assume a dominant posture or aggressive communication, I disagreed with him immediately. A few minutes later Velzy started to look more relaxed and I was able to get him to come closer by using treats so we went out for a short walk. The walk went well and the Martingale stopped Kai’s pulling. But the lack of aggression when on the walk was expected as the dog’s guardian had mentioned that the dogs got along fine when walking together. It was just inside the home that trigger Kai’s aggression. We returned to the house and this time brought Velzy into the living room off leash while I kept Kai on his. In the first few moments Kai attempted to start things up with Velzy a few times but I was watching him and ready to offer a correction. After a few minutes Velzy started to take on a more relaxed body posture and Kai’s attempts to control the situation abated. I tried to get the dogs together at this point but Velzy got tense as soon as I did so I decided to use some dog psychology to change the dynamic between the dogs. I started out by having Velzy’s guardian walk him over to Kai’s bed. At first Velzy wanted nothing to do with it, so I gave him a high value treat that did the trick. It took a little coaxing, but they were eventually able to get him to sit, then lay down in the bed with Kai observing from a few feet away. We waited a bit, offered Velzy some positive reinforcement and a few minutes later could see him relax again. In fact, after a while Velzy got up and started playing with one of Kai’s toys – something his guardians said he had never done before. When the big dog started to move around a bit, Kai started to react a few times but I was able to correct him early enough to stop him before he got started. We continued with the territory and possession reversal exercises and dog psychology for another 15 minutes or so and by that time, you wouldn’t have known that Velzy was at all fearful of Kai. Because dogs eat by rank when living together, I wanted to show their guardians how to feed the dogs in the same room in a very structured way. This proved to be a challenge due to Velzy’s extraordinarily strong food motivation. As soon as the guardian started to prepare the food, Velzy started to get excited. When the guardian started through the baby gate, Velzy nearly tackled him. His guardian told me that usually as soon as they put the bowl on the ground Velzy rushed over and ate it very quickly. I knew helping the dog learn self control would help him in a number of areas so I walked his guardian through placing the food down in much the same way I did when I opened the kennel. The guardian went through the motions of getting the bowl of food and walking over to place it on the ground; but the second that Velzy started to show excitement, the guardian paused or stopped. It took about five minutes, but eventually his guardian was able to place the bowl of food on the floor while Velzy remained in a sitting position. I suggested that his guardian continue using this technique at meal time, but only as long as Kai was calm. Due to his previous dominance and aggression towards Velzy, an outburst from him while asking Velzy to remain sitting will be extremely difficult. It will be important that one of his guardians keep Kai on the leash on the other side of the room calm and quite. I showed them how to disagree with him the instant that he shows any signs of dominance or aggression (staring, lowering his head, growling). This will be challenging but now that his guardians know what these early signs are, they will be able to stop Kai’s aggression before it actually starts. After Velzy finished eating, Kai’s guardians moved him away then gave Kai permission to eat his food. In the future I suggested before the feeding ritual starts that the human eat something (a few bites of a snack or full meal) first. Then feed Velzy next and Kai last. By controlling feeding time this way (only when completely calm, one at a time with the other dog present from a good 10+ feet away), the dog’s guardians dominion over this primally important activity will help the dogs see and respect their authority. I also suggested that the guardians spend time ever day with the dogs together in the same room. The dogs need practice being together in a calm way. At one point they had tethered Kai on a leash while Velzy was in the room, but Kai simply barked, growled, lunged and snarled at Kelzy the whole time. That exposure will only reinforce Velzy’s fears. But having the dogs in the same room while completely calm is an important step in the rehabilitation process. You have to crawl before you can run. As they practice being together in a calm way, the dogs will grown more comfortable in these new behaviors. This will lead to fewer and less intense outbursts from Kai and higher self esteem in Kelzy. Knowing Kai’s signs and reacting as soon as they start will be another key factor in bringing balance into this home. Because of Velzy’s low self esteem and Kai’s outright dominant aggression, it will be extremely important that the dog’s guardians assume the leadership role and maintain order. As Kai sees that he is no longer has status or authority greater than Velzy, he will start to feel less and less dominant. As Velzy sees his guardians controlling the situation, he will become less fearful and more confident. By the end of the session the dogs were laying down napping in the same room. This is a pretty big thing as dogs usually won’t lie down near another dog it considers a target or threat. They were no doubt tired from the session which is another part of the rehabilitation process (draining energy apart before practicing with them together), but we made some fundamental psychological and social structure changes that were also having big impact. If their guardians continue practicing the exercises, new non verbal communication and take ownership of the leadership position, these dogs will gradually learn to coexist and in time, interact and even become pals. It will likely take a few months before that level is reached, but based on how much progress we made in today’s session I think its only a matter of time.